How Do You Stop Underarm Sweat? How Do You Stop Underarm Sweat? →How Do You Stop Underarm Sweat? To stop underarm sweat is not 100% possible, but you can significantly reduce sweating. Sweating is your body’s natural way of controlling its temperature, but for some of us, it’s more than just a natural heat-regulating mechanism, it’s also a source of embarrassment. Approximately 3% to 6% of all people from all around the world suffer from hyperhidrosis, which is a condition that is associated with excessive and unpredictable sweat gland activity. Be Extra Conscious of Your Hygiene. Be sure to shower at least once a day and to never wear the same shirt twice. You should also try wearing a t-shirt under your work shirt. The t-shirt will help to absorb sweat so you won’t get any embarrassing sweat stains under your arms. Shave. Be sure to shave your armpits on a regular basis. It won’t make your armpits sweat any less, but it will prevent sweat from collecting there. Exercise. Many times, excessive sweat is a symptom of excess weight or obesity. Fat insulates your body, which will push your body’s temperature up immensely. Contact your doctor about your ideal BMI and try to work towards achieving it. It will make a world of a difference. Drink more water. By drinking at least 1/2 your weight in ounces, you will flush some of the toxins out of your body. Toxins contribute to underarm sweat. Eat more vegetables. Eat less very little processed foods and more vegetables if you want to reduce sweating. Mix water and baking soda in equal parts so it makes a paste. Wait 30 minutes and then rinse the sweat-controlling paste off with water. This may sound a bit strange, but here is a solution that really works: Apply a mixture of tomato pulp and lemon juice to your armpits and then wait 15 minutes before washing it off. Another trick you can try is to rub apple vinegar under your arms. Apple vinegar will help to keep your underarms sweat-free and at the same time helps to neutralize odor-causing bacteria. In addition to the above methods, you can also try drinking sage tea. Sage tea lowers your body’s temperature, which in turn helps you to sweat less. Buy Antiperspirants. Contrary to popular belief, antiperspirants and deodorants are two completely different things. Deodorants fight the smell of sweat by targeting bacteria, while antiperspirants physically help you to sweat less. There are many different types of antiperspirants available at retail and online stores nowadays. Some of them rely heavily on ingredients such as aluminum to lower perspiration levels, while other types of antiperspirants offer consumers more natural options. FEEL FRESH & PROTECTED. Effective odor protection without the stickiness. In the office, the gym, during a night out or on a long distance flight – this deodorant will not let you down. SCENTS FOR EVERY TASTE. ‘Original Essence’ blends fresh, floral and zesty tones, creating a unique, well-balanced scent. HIGHEST QUALITY. At Bali Secrets we are committed to only creating and sharing products we ourselves LOVE. That’s why the ingredients for our deodorant grow organically under a warm tropical sun – in harmony with nature. MADE WITH LOVE IN BALI. The Island of the Gods is known for its beauty and kind-hearted people. For generations, the Balinese have utilized their close relationship with nature to produce outstanding herbal remedies and natural cosmetics. All Day Protection: Our natural ingredients work together to kill odor-causing bacteria and keep you smelling fresh. Lemon is rich in vitamins and minerals like pectin, vitamin C, and magnesium – and has been used for centuries for its antibacterial properties. Lime and thyme balance the scent profile and ph levels. 100% Natural: Our deodorant is made with 5 vegan, edible ingredients. Unlike regular antiperspirants, our deodorant does not contain any toxins. It’s organic, gluten-free, aluminum-free, soy-free, sulfate-free, paraben-free, phthalate-free, GMO-free, and BPA-free. Sustainable: We believe in giving back – We embody this ideal by sourcing sustainable ingredients and supporting social responsibility initiatives. Our container is 100% recyclable and the paper is fully biodegradable. Our manufacturing facility is certified as a B corporation. This means they have met rigorous standards of social and environmental performance, transparency, and accountability. Unprocessed: Our deodorant relies on your body?s natural heat to glide on smoothly. We use magnesium hydroxide instead of baking soda (which can irritate the skin). Our products are naturally scented with high grade, organic essential oils. Made in the USA: All of our deodorants are produced by hand in small batches right here in Fort Wayne, Indiana. The clean, herbaceous fragrance of Lavender + Sage is tranquil and soothing. 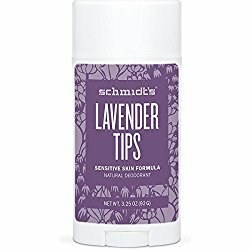 A top-selling item, Lavender + Sage is Schmidt’s most popular deodorant! GET A FREE 1oz TRAVEL SIZE – A $7.99 VALUE. No need to jump through extra hoops to get a free travel size. It’s included in our beautifully packaged set. Your order arrives in a CIRA SPA reusable box and includes a set of two artisan natural deodorant tubes – one 2.7oz and one 1oz travel size. 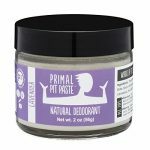 Feel free to compare with other best-selling natural deodorants for women or men – This Is A Great Deal. 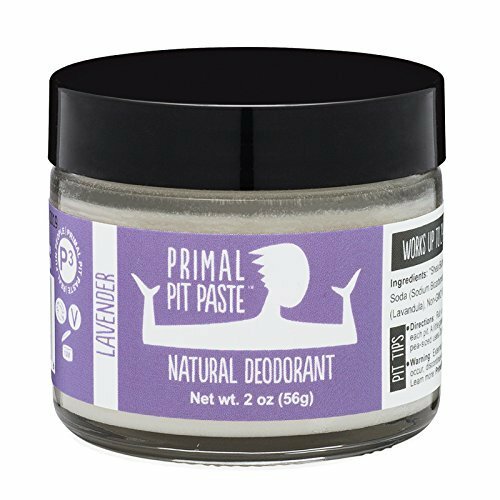 A TRULY NATURAL DEODORANT that actually works. 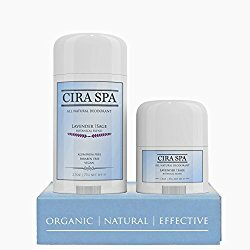 Cira Spa All Natural Deodorant without Aluminum gets the job done with long-lasting protection from body odor, and is great for women, men and kids. Smell great all day. With just a hint of lavender and sage, you won’t be smelling your deodorant all day. Instead, it will fade to the background where it belongs, protecting you and keeping you odor-free all day. NO MORE CHEMICALS on your body. Feel good about putting non-toxic, native ingredients on your skin. Organic, All-Natural, Non-Toxic, No Aluminum, Paraben-Free, Vegan, Gluten-Free, BPA-Free, SLS-Free, Soy-Free and No Propylene Glycol. Our ingredients are great for the skin and actually help you eliminate toxins caused by the chemical build-up of conventional deodorant. Shea butter, coconut oil, arrowroot and aloe vera help pull out toxins and moisturizing your skin. GOOD FOR THE ENVIRONMENT And MANUFACTURED IN THE USA. We are a cruelty-free facility and use no animal testing on our products. Our tubes are made from BPA-free plastic and are recyclable when you are done with them. So you can feel good about the effect of your deodorant on the environment, too. We understand the importance of providing local jobs and reducing our global footprint whenever possible. That’s why we source our materials in the USA whenever possible.